If public sector workers have it so good, how come private sector firms dominate best employer lists? The Canadian political elite really needs to be much more consistent in their propaganda. They like to whip up antipathy towards public sector workers suggesting they are overpaid and pampered, but they may have overlooked that strategy recently in the rush to give themselves a pat on the back. Ontario PC leader Tim Hudak uses such sentiment to advocate for public sector wage freezes and more recently has set his sights on attacking modest public sector pension plans. Hudak is banking on a policy of reducing the modest pension incomes of seniors as a vote getter. Good luck with that, Tim. But if things were indeed so cushy for public sector employees, you’d think public sector employers would absolutely dominate year-end best employer lists, especially given these lists are made up by the same media conglomerates that peddle this anti-public sector message. On Monday the Globe and Mail published its top 20 list of Canada’s top family friendly firms for 2013. The peer review is done, but the details around the 6 per cent in cuts to the Perth and Smiths Falls District Hospital are still somewhat sketchy. The cuts are to deal with a $2.6 million operating deficit at the hospital. Among the many cuts will be closure of 12 beds at the hospital. The unions that represent employees at the hospital have been given some idea of the impact after receiving notice of layoffs and reductions in hours. 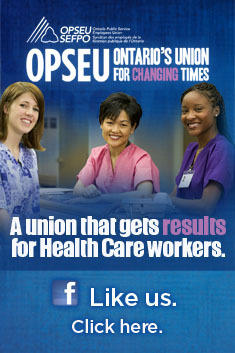 For OPSEU, the biggest reduction is in physiotherapy – the equivalent of more than three full-time positions is being lost. In addition OPSEU is losing one full-time professional in diagnostic imaging and scaling back hours for a dietitian, health records and a staff member assigned to assist victims of sexual assault and violence. Other positions that are either being lost or reduced include nurses in the operating room, obstetrics, emergency room, and on the medical/surgical floor. Community members will find it more difficult to get through to the hospital switchboard, with hours scaled back, along with other impacts on purchasing, housekeeping, food services, rehab, patient registration, discharge and finance. Staff of the Perth and Smiths Fall District Hospital were told today CEO Todd Stepaniuk has resigned. Stepaniuk, who helmed the organization for 12 years, appears to have lost a battle with his board over the hospital’s performance improvement plan. Staff was told that Toronto East General Hospital CEO Rob Devitt will be instead leading a four-member peer review team to find ways to eliminate a rising deficit at the district hospital. Last year the hospital finished with a $700,000 deficit, expected to rise to more than $2 million this year. Devitt’s team will begin their work July 13 with their recommendations expected in September. The hospital was supposed to submit a performance improvement plan (PIP) to the South East LHIN in May, but the board rejected the proposals brought forward by Stepaniuk and the Senior Management Team. After all the talk about system integration it’s notable that the CEO of a Ontario public hospital should argue for a merger on the basis of enhancing the institution’s power base. This hardly strikes us as being in sync with the present evidence-based narratives emerging from the Drummond Report or the Minister of Health’s new action plan. Isn’t health planning supposed to be about providing care in the right place at the right time by most appropriate provider? The “power” scenario suggests the province may be making decisions on a different basis. It is even more surprising given one of the two potential dance partners in the merger is Rob Devitt, CEO of the Toronto East General Hospital.